In our modern age using a keyboard is necessary for almost all complex interactions with computers and other electronic devices. Yet as boomers, we did not have the advantage of knowing this electronic revolution would require each of us to learn to type in one form or another. Consequently, some of us took typing classes in school, but most did not. Typing classes were not required in any school district in the country. In the Boomer Era, a high school diploma was the equivalent of today’s college degree. As a result, most boomers were headed to work after high school, not on to college, as only about one third of Baby Boomers received a college degree. As a course elective, girls were drawn to learn the skill of typing more than the boys since a good portion of employment was divided by gender-specific roles — some jobs designated for women, some for men. Girls who took typing classes were more employable for the secretarial pools which they could look forward to joining after graduation. The boys were more apt to go to factory or office work, where typing, if required, would be done by secretaries. Typewriters became a part of the business world in the late 1800s, during the Industrial Revolution. Up to that point rows of men hunched over desks copied correspondence, inventory and financial figures by hand, as they had for centuries. The typewriter introduced a new efficiency to business. In that era, both men and women became typewriter operators, but it quickly became a profession for women as the YWCA started teaching them how to operate the machines. The first electric typewriter was invented in 1902 to further that efficiency, but did not catch on very quickly. However, it took two circumstances to affect the adoption of typing classes in schools. First, the development of the QWERTY keyboard in 1878 made the idea of touch typing — that is, typing without looking at the keyboard — a possibility. The earliest keyboards had the letters arranged in alphabetical order. The common belief is that this arrangement caused a lot of jamming in early typewriters as the mechanical arms swung up to strike the paper, so a more efficient means was explored. Secondly, as business boomed, educators began to look at typing as a useful skill to teach their students. The first typing classes appeared in 1915. The smattering of courses taught in the public school system around the country continued through the 1920s. The idea never caught on with educators enough to raise the course to required status. IBM introduced the IBM Selectric in 1961, and quickly captured about 75 percent of the business market. It was the first electric typewriter to offer a type ball that could be swapped to change fonts. When boomers began taking typing classes in the 1960s, most school districts either could not afford — or did not want to commit — the funds to the electric models. Consequently, a good portion of boomers who took typing classes learned on manual models. By the 1970s, electric machines replaced the manual models in most high schools. This was a big deal, because boomers will tell you — like driving a car before power steering, typing was a physical task. It took finger strength to strike the keys, and they had to learn to strike them with equal pressure across the keyboard. Speaking of boomers and typing, here is a fun fact: it is commonly repeated that the mother of The Monkees’ Michael Nesmith invented Wite-Out. Earliest versions of typing correction fluids made their debut in the 1920s, but Bette Nesmith Graham developed her version in the 1950s when she worked as a secretary for an insurance company. In 1956 she patented her formula and named it Liquid Paper. A decade later she was making millions. In 1979, she sold her company to the Gillette Company for $47.5 million dollars. Her son Michael inherited half of her fortune when she died in 1980. So now you know — it wasn’t Wite-Out, it was Liquid Paper! Mister Boomer did not take any typing classes, ever. In college he developed his own hunt-and-peck style to type his term papers. Incidentally, studies show that people who use the touch type method are not necessarily any faster or more accurate than people who are self-taught with various other methods, including hunt-and-peck. Mister B preferred to write his papers longhand first, then the final edited version was typed for handing to the professors. His father had purchased a used manual typewriter when Brother Boomer went to college, so that became Mister B’s hand-me-down. 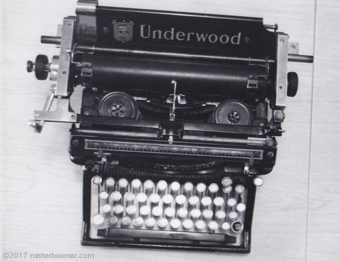 It was a 1929 Underwood, and served Mister Boomer well into the 1970s until he began his work career. The 1929 Underwood manual typewriter that Mister Boomer used in his college years. Today using a keyboard is an everyday occurrence, but typing classes are still not a required subject. Classes are offered, but no longer referred to as “typing.” Classes are taught now under the title, “keyboarding.” As time marches on, even the QWERTY keyboard is in question, too. Alternate arrangements of the keys are being touted by some companies to reflect today’s double-thumb typing on mobile devices. Still others say the future belongs to voice recognition. When that day comes, boomers who did not learn how to type will be on the same level as today’s kids, who start using keyboards as early as age two or three. Keyboards will begin to disappear and become yet another invention that boomers will have a living history with, only to see them go extinct in their lifetimes. Did you take a typing class, boomers? Once the mad dash out the school doors was history, boomers couldn’t wait for a summer of outdoor play. And that is exactly what boomers did: spend as much time as possible in the Great Outdoors. A typical summer vacation day for Mister Boomer and his neighborhood was to get up the same time as when school was in session, have a bowl of cereal, and head out the door. He wouldn’t return until dinner time, though on occasion stopped by his house for a cool drink from the hose or a quick sandwich. Parents knew their kids were with a group of other kids, and didn’t know or need to know where they were at any given time. Truth be told, Mister Boomer, his brother and a host of neighborhood kids might very well be a close as a block or two away, or as far as many miles via bicycle. For Mister Boomer, outdoor play fell into a few categories. One of the most popular among his neighborhood was the all-day baseball game. Innings easily reached double-digits as playing was more important than a game winner or loser. Another was to play in nearby woods and fields. The boys could imagine all sorts of army scenarios, hunt for snakes and mudbugs, pick wild berries and create make-shift weaponry from fallen branches. At one point the neighborhood was deeply involved in creating tree forts. More like platforms than actual buildings, the boys scrounged chucks of wood in alleys and fields, then borrowed hammers and nails from their fathers’ workbenches. Each fort in the forest was built and occupied by four to six boys, and ranged from 10 to 20 ft. off the ground. Meanwhile, boomer girls in the neighborhood sometimes hung out with the boys, but more often they chose to play in the yards of their neighborhood friends or at the elementary school where the city had various day camp activities available. Mister B would ride Sister Boomer over to the school on his bike, where she could learn how to weave strips of vinyl into useless keychains, among other things, while Mister B might play a game of table hockey. After dinner, most kids headed back outside. Mister Boomer’s neighborhood often had games of hide and seek. Both boys and girls from seven to early teens would participate. The games would encompass the entire block and have more than fifty players. Once the game was finished, kids could sit on porches or lie in the grass and stare at the constellations. No one had air conditioning in his neighborhood, so the night air felt good after being in the hot sun all day. By comparison, today’s kids don’t like to spend much time outdoors. Everyone knows kids don’t have the freedom to roam the way boomer kids did, but the results of these changing times have short and long-term ramifications on the health of children. The birth rate has declined by 41 percent since 1960, so neighborhoods have fewer children who can get together as a group. Parental worries about heavy street traffic, pedophiles and missing children add to the mix. A survey by the Center for Disease Control and the Kaiser Family Foundation discovered that on a typical day a child is six times more likely to play a video game than to ride a bike. Bike riding is down 31 percent since 1995. Many surveys are trying to get to the bottom of this trend, and have discovered some interesting reasons for the indoor preference. One line of thought blames air conditioning. In boomer days few people had home air conditioning. In Mister Boomer’s case, only some stores and the movie theater had it. Kids now have never lived without it, and have grown accustomed to indoor air rather than outside heat. Others point to the parents. A survey by the Sports & Fitness Industry Association (SFIA) found that participation in every organized sport — including soccer, basketball, football, track & field, baseball and softball — has dropped significantly in the past five years. Softball alone has seen a drop of 30 percent in participation. When asked, parents offered several reasons why they preferred their children not to participate in these organized outdoor activities: risk of injury; behavior of coaches; commitment of time; cost; and the emphasis on having fun over winning. All valid reasons, but other outdoor play does not seem to be substituted. Some studies point to the release of Nintendo 64 in 1996 as the beginning of this downward trend away from outdoor play. Video games were around since the early 1970s, but the release of Nintendo 64 greatly enhanced the look and feel of the games, and expanded the amount of games available. The Kaiser study found, on average, today’s kids ages eight to 10 spend six hours a day watching TV, playing video games and using computers. So, were we boomers outside more simply because we had no other choices? Or are today’s kids inside because of overprotective parents and an addiction to all things electronic? Scientists and physicians predict this trend toward less outdoor play will result in a less healthy generation, which is already reflected in the obesity rate among children. Could it be the answer to much of our country’s health concerns — especially among children — is more outdoor play? What memories of summer outdoor fun do you have, boomers?